Dial plan testing in HCS environments is a complex and time consuming task, which especially as new countries and their associated dial plans are added to the HCS solution over time. 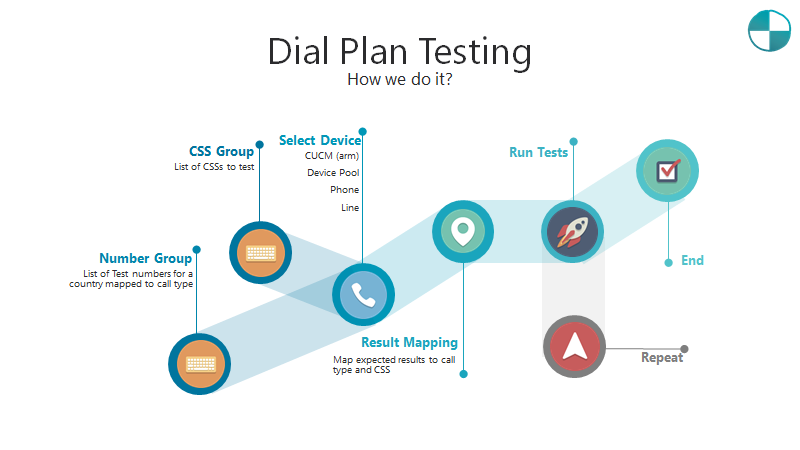 The dial plan test plan provides automated testing that enables a robust and consistent test regime that ensures a quality user experience before and after planned updates and changes in the HCS dial plan. The site migration test plan has been designed for testing and verification of porting and site migration activities. 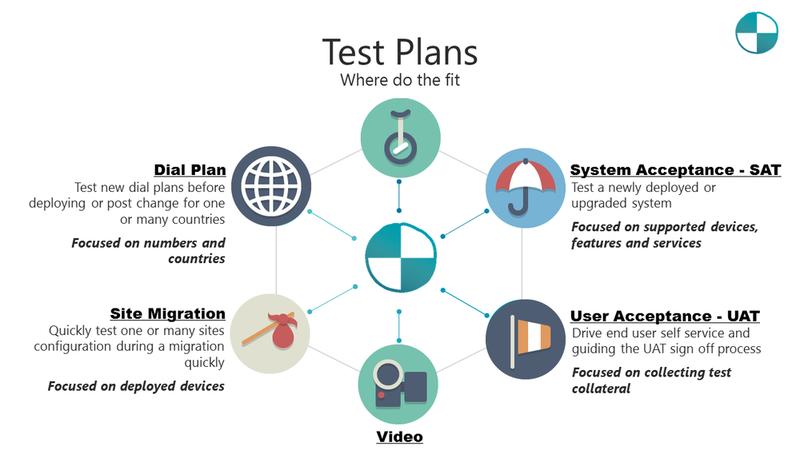 During the setup and execution of this test plan Testmate takes control of registered devices in the nominated device pool and orchestrates a variety of tests between phones and uses the JTAPI remote. 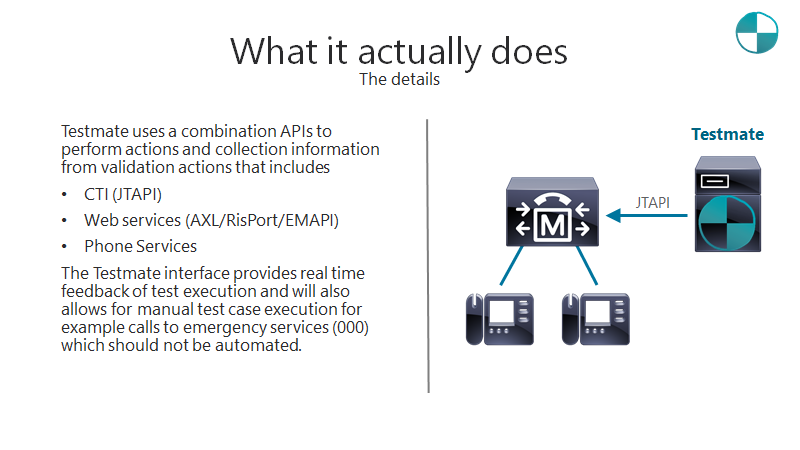 This test plan focuses on the test of site specific PSTN and media services and is intended for use by deployment engineers to be able to quickly perform pre-site commissioning testing in an automated manner. The PSTN load test plan enables load testing and verification of number of calls that can be established between two CTI route poinst. 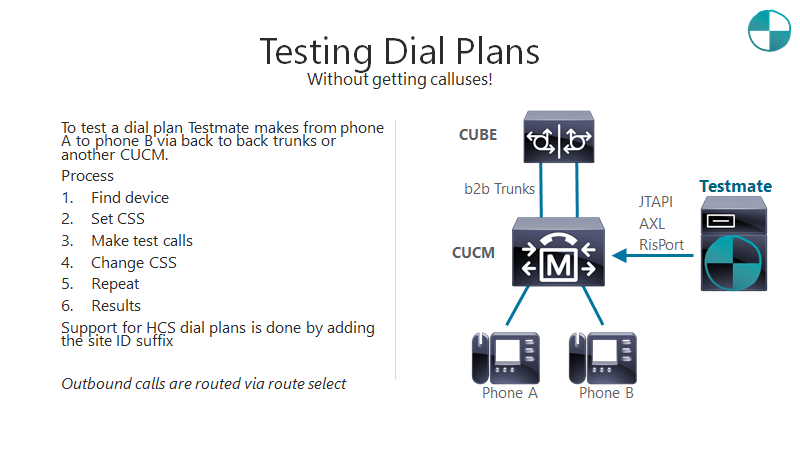 The CTI route points can be located on either two different clusters connected by either PSTN or private trunks to determine the maximum number of calls supported on the trunking infrastructure or for testing Call Admission Control limits between two different locations on the same cluster. Supporting Jabber beyond the network boundary is has become a complex and time-consuming task due to the limited control of the environment. When issues arise the traditional methods of troubleshooting require a high level of expertise, operational resources and direct involvement by the end user with issues normally taking several interactions to resolve. This leads to diminished customer satisfaction with the solution. Also providing effective assurance faces the same challenges beyond the network boundary to determine if call quality if being affected by network degradation or impairments. The Post Change Verification test plan provides a deployment architecture and commercial model that makes it easier to adopt automated testing for all post change verification activities.